Speaking of the days leading up to Superior, it had been quite a rollercoaster. My summer of running, racing and training had been going well. I set a 10 minute personal best at my favorite 50 miler, the Voyageur 50 mile trail race, the last weekend in July. I ran the Marquette 50k trail race 2 weeks later on tired legs, and little sleep as a final long training weekend. After that I was really looking forward to a nice taper before my goal race of the season the Superior Fall Trail Races 100 miler. One week after Marquette, in the first mile of my Saturday morning long run, I stepped on a rock or root and immediately turned my ankle. I had injured the same ankle on a run in April; it had healed and hadn’t given me any issues up until then. It hurt so bad! I limped painfully back to the car where I was able get ice cold water on it right away. I was totally bummed. I had no idea if I was going to be able to race in 13 days. I spent the next 13 days tapering in a big way, with very little running, lots of icing, and trying to be as careful as possible. I had no idea if it was going to hold up for 103.3 miles of rocky, rooty, single track trail. But I was definitely going to try. Race week arrived, and on Thursday morning Matt, my friend, Alisha, and I drove up to Two Harbors where the race would begin at Gooseberry State Park the next morning. We set up camp, visited with my parents who would be with us for the weekend, and hit the pre-race meeting before calling it a day. Friday morning we made our last minute preparations and drove to Gooseberry State Park. It was a beautiful morning, and the weather forecast looked ideal. Rumor had it the trail was dry, and conditions were perfect. At 8am after hugs from our friends, and words from the race director, we were off down the trail. It was going to be a 103 mile adventure in the woods. At the start with the best crew chief ever! Alisha, Jen & I ready to go! The first 4+ miles are on a paved bike path that runs parallel to Hwy 61 going north along Lake Superior. I connected with Alisha, and my friend, Jodee (who paced me last year, and was taking her first crack at this event,) and we chatted easily those first few miles. Soon enough we crossed under the main road, and up the steps to the single track Superior Hiking Trail that we would be following all the way to Lutsen. We wouldn’t see pavement again until we were within striking distance of the finish line. We shifted into a single file line on the trail, trying to find our rhythm among the rocks and roots. It wasn’t but a few minutes into the single track that I stepped funny with my left leg, and my ankle gave me a “zinger.” Oh, ouch. Crap. I hadn’t rolled it, but just a tiny bit of a funny foot placement, and it was not happy. “Ok, be careful. Watch every step,” I told myself. I walked and ran, and made my way up the trail as carefully and efficiently as I could. The first major landmark is the Split Rock River. There were a number of volunteers there to help us navigate the river crossing since the bridge washed out a couple years ago. I made it across with only the tip of one shoe getting wet. From there its up to the Split Rock aid station. This came up faster than I thought it was going to. Come to find out my GPS watch was a full mile off by this point – it showed 8.6 miles in, when we were actually over 9 miles in. Ok, I was happy with my time given my conservative start once I realized the discrepancy with my watch. 10 more miles and we were at the first aid station (Beaver Bay) where crews were allowed. It’s always fun to come in here, since there is so much excitement. Just about everyone’s crew is here and the energy is over the top. I really try to spend as little time as possible in aid stations, but after finding the one muddy spot on the trail, and going over my shoes, I needed to change socks. I took the time to change socks, refill my pack and grab a couple of cookies from the aid station table before getting back on the trail. As the day rolled into afternoon, and I kept checking off the aid stations, I started to worry less about my ankle. I had found a rhythm and was moving consistently. I spent most of the day running alone. I didn’t mind the solo running. In fact, I prefer it. I was able to turn off my brain, soak up the day, and keep moving. The sun started to drop in the sky and the shadows were getting longer. I was getting closer to the County Road 6 aid station at 43+ miles where I would prepare for sundown and pick up my pacer, Robyn. Robyn and I would run the entire night together. Having a pacer overnight can really help those miles go by more quickly. I got into the aid station at 7:30pm where my crew was waiting with my waist light, extra layers and a chicken wrap. I was ready for some “real” food, after fueling on pb&j, tailwind, gels, honey stinger waffles, and who knows what else! I’m lucky that I can eat most anything during these events and not suffer any significant stomach upset. Many runners are not that fortunate. It was still warm, so I tied a long sleeve shirt around my waist, finished my wrap, and grabbed Robyn. It was time to go into the night. The next 7 miles went by quickly as we chatted about who knows what… the sun set and it got totally dark, but before long we were following the spur trail into the Finland aid station at 51 miles. This would be the last time I saw my crew until morning. It was about 10:00pm and I fueled up on mashed potatoes and bacon. So delicious. I didn’t have much more I needed to do, so Robyn and I headed off back down the trail. The more time spent at the aid stations, the later your finish time is going to be, so I really try to be efficient in them. Another 7 miles and we arrived at the Sonju Lake aid station where there is no crew access. This is a quiet mirage in the middle of nowhere compared to some of the other aid stations. I didn’t need much here, some food, a refill of water in my pack, and we were on our way. The Crosby section is one of the harder sections on the course. At 9.4 miles it’s one of the longer sections. It starts with a long decent to the Manitou River, then it’s a long (really long) uphill to Horseshoe Ridge. From there it’s some nondescript single track to the Caribou River, then some runnable trail to a covered bridge and then another mile or so to the aid station. I have done this section a number of times in the daylight during training, so I can learn the landmarks and be better mentally prepared for this long, dark, section. I’d like to say it helped, and it may have, but I still struggled. Robyn was doing an awesome job of keeping me entertained with stories of kids, backpacking, the boundary waters, cats, and life in general, but I still felt like this section would never end. At one point we even came upon another runner and his pacer taking a nap along the trail, and it really startled me because at first glance, I didn’t think they were napping! I was sure they were dead! Luckily they were napping, and a few miles up the trail they easily passed us. We finally arrived at the Sugarloaf aid station. It was 6:15am. Robyn and I had been together for almost 11 hours. The sun was coming up. It was turning into another beautiful day. My crew was here, and Robyn was staying here to volunteer until the aid station closed later that morning (talk about a rockstar! Run all night, volunteer all day! Robyn is amazing!) I decided to change shoes and socks here, and prep for a new day. Bacon and hash browns for “breakfast,” new shoes and socks and I was ready to rock the next 5 miles on my own. I put in one ear bud and cued up the music. I was ready for a new day. This section started great, but towards the end, my left knee started to give me fits. A sharp shooting pain out of the blue would sideline me for a step or two then go away. I hobbled into the Cramer Road aid station where the marathon distance event started at 8am. I like arriving at Cramer Road before the marathon start, to soak up some of the energy of the fresh runners. I figured they had all headed out already since it was after 8 when I got there. I had some more food, a Tylenol for my knee and picked up my pacer, Cary. We were back on the trail. I was in a low thinking my knee was going to continue to bother me. What I didn’t realize was the marathon course does a little extra before funneling onto the single track trail, and I was still on the trail ahead of many of the marathoners. A number of friends ran by giving cheers of encouragement. I was starting to feel better. Riding the wave. Finding my rhythm again. My friends, Alysia and Natasha, leap frogged me a few times snapping pictures. Pretty soon I forgot about my knee and my ankle and any of my previous lows. Riding the wave. Life was good. I got into the next aid station, Temperance River, had a quick bite to eat, and hit the trail in record time. All of a sudden, I was a woman on a mission. I was feeling good, passing people, and knocking off decent mile splits (for 85 miles into a race at least!) I started to ask Cary about what time it was, and we started to figure out if I could break 32 hours. Earlier this summer, my goal for Superior was to try to break 32 hours. I had given that goal up with my most recent ankle injury. But here I was 85+ miles into my race, and feeling good. Could I do it? Just because I hadn’t ever broken 32 hours before didn’t mean I couldn’t do it now… I needed to run no slower than 20 min pace for the rest of the race. Now most of you could probably go out and walk a 20 min mile right now, but I was 85+ miles in, and knew I had a number of significant climbs left, and I didn’t know how much gas I had left in my tank. And try I did. Up over Carlton Peak, into the Sawbill Aid station, through the fairly boring 5 mile Sawbill section, and into the final aid station at Oberg Trailhead. I rolled in here at 1:45pm. It was 7.1 miles to the finish. 20 min pace wouldn’t get me there now. I needed more. This section has 2 major climbs, Moose and Mystery Mountain. I didn’t know if I could do it. I ran as much as I possibly could. At Moose Mountain I hiked as hard as I could. On the downhill from Moose, I passed my good friend, Stephanie Hoff, who was struggling, but would with no doubt make it in with plenty of time to spare; high fives and cheers from her and her pacers pushed me onward to Mystery Mountain. A number of runners on the switchbacks up the last major climb gave me something to aim for, and I continued to pass as many of them as I could. I know the landmarks toward the end of the course, and they started coming up – the corner where you can see the ski resort, but turn the opposite direction, the campground, the downhill toward the river and FINALLY the Poplar River - the last major land mark before turning off the Superior Hiking trail onto a two track that leads to Lutsen Ski Resort. All along, Cary had been behind me, keeping me going, reminding me to continue to fuel, hydrate, mile splits and the time of day, and staying focused on my goal - getting in before 4pm and breaking 32 hours. I ran that two track, and road through the ski resort as hard as I could. I still didn’t know if I would make it before 4pm. It was getting close. 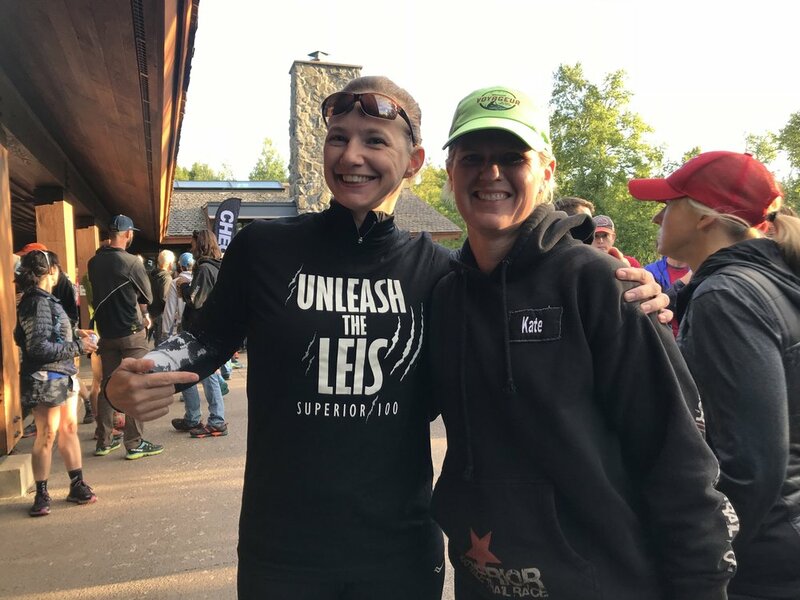 I rounded the corner of Caribou Highlands Resort, around the pool, and into the finish area – 31:56… I was greeted at the finish line by friend, and awesome volunteer, Julie, and my amazing crew and family, tears streaming down my face. I did it. I really did. With all the doubts leading into the race, I still hit my goal of running sub-32 at Superior, and I couldn’t have been more thrilled. It was one heck of a race. I’m not sure what possessed me to decide to run sub-32 in the first place, but that goal motivated me to put forth my hardest effort yet, and a 33 min PR from my 2015 time of 32:29. I could not have reached my goal without the help of my coach Jake at Trail Transformation, my amazing crew that included my wonderfully supportive husband, Matt, and his Mom, Sandy; my fabulous pacers, Robyn & Cary; all the wonderful race volunteers and Rocksteady Running. And remember, don’t let your past dictate your future. Thank you pacers! I couldn’t have done it without you!! You guys rock!